In late January, the chief of the General Staff of the Russian Armed Forces, Army General Valery Gerasimov, told the media that Russia would take countermeasures against the deployment of the US global missile defence system. Gerasimov underlined that the countermeasures would be aimed at equipping the Russian army and navy with promising complexes and weapon systems that could neutralise the potential of US missile defence system, and will have an increased capacity to defeat it. He did not name any particular systems, but the RIR has come up with a ranking list of the best weapons against US missile defence system. The new intercontinental missile RS-26 Rubezh is the latest development of the Russian defence industry. The missile is also known under the working name “Avangard”. Due to the secrecy of the project, we know very little about it: this prospective missile is built on the basis of RS-24 Yars, which has been supplied to the Strategic Missile Forces of Russia. The missile is solid-fuelled and is equipped with a separable warhead. 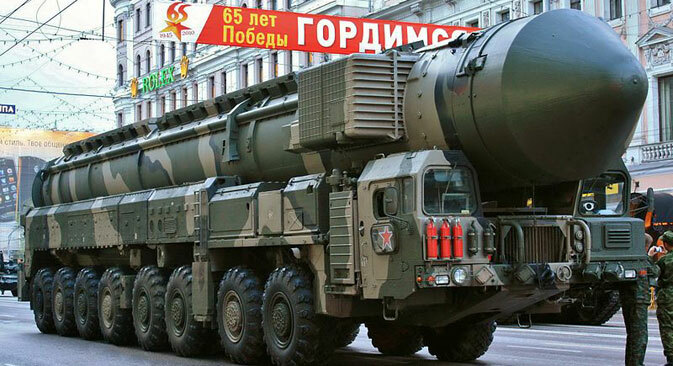 The quantity and the weight of the warheads carried by this missile are still unknown, but considering that it is the modernised version of Yars missile belonging to Topol-M family, it should weigh at least 60 tonnes. It will only be released in the mobile version, and over time is likely to replace the aging Topol systems. Russian military officials say that the missile check launch will be carried out in March this year. Earlier, the tests took place under a veil of secrecy. However, in 2013 the information about the tests of MS-26 at Kapustin Yar testing site still leaked out to the media. Back then, the General Staff reported that it would be the fourth launch of Rubezh. According to Colonel-General Zarudnitsky, the new missile has the new combat equipment and has superior capacities and improved manoeuvering characteristics in comparison with existing systems. The conflict with Ukraine (that has cut the supplies of spare parts for Voevoda maintenance) and missile defence plans of the US have left no choice to the Russian military leadership. In 2018-2020, Russia will receive new heavy missile Sarmat, which is being developed by a whole consortium of companies led by Makeyev State Rocket Center. The purpose of its creation is quite easy to figure out. Topol, which is currently in service, has a throw-weight of 1.2 tonnes and throw-distance of 9.000 km, while Voevoda is ready to throw 7.3 tonnes at the enemy at a distance of up to 16,000 km. If the data leaked to the media is true, Sarmat will be half the size of Voevoda. Its starting weight will only be about 100 tonnes against Voevoda's 211 tonnes; it will be capable of launching 4 to 5 tonnes, which now will be capable to accommodate many more tonnes than in the early 1980s when Voevoda was created. In addition, long throw-distance provides for missile leeway before and after the launch. Missile R-30 Bulava, so long awaited by Russian submariners, is finally joining the ranks. This weapon of Borei-class submarines was originally developed for defeating complex defence systems: it carries 10 warheads, which following a sudden gun salvo fired from underwater can be launched anywhere in the world from a distance of more than 11, 000 km. In fact, Borei can shell, for instance, the United States without even leaving their location sites in the North or the Pacific Fleet. Each submarine is equipped with 16 ballistic missiles R-30 Bulava-30. The submarines are silent, feature excellent hydrodynamics and in case of conflict have a good chance of making an unexpected strike-back. According to some reports, Bulava's concept of operation is different from the Topol-M on the basis of which it was created. Topol-M's warheads are brought to the target, and then scattered over it, while Bulava works differently. The so-called vine principle works here, when the individual blocks can be separated from the missile during its flight.